Need an easy way to identify your luggage when it comes down the carousel at the airport? Just watch for the one exploding with tribbles. Tribble Incubator (Can be used as suitcase if in a bind). The Trouble With Tribble Incubation Is, Let's Be Honest, The Mess. Ughhh. So What We Have Here Is A Jaguar Tribble Incubation Chamber On Wheels, With Handles, Expandable (A Good Tribble Breeder Knows The Need For Expansion! Am I Right Or Am I Right? ), and From A Non-Smoking Household. As A Straight-Shooting Former Tribble Farmer, I Had To Relocate From The Wide Open Spaces Of, well, Space To A More Compact Urban Environment. Thus I Purchased This Fine Model Of For Urban Incubation. Long-Story-Short, Numerous By-Laws, Pleas From All Wives (former and the current), and Some Professional Help, Left Me With A Tribble Incubation Chamber That Was Used Mainly For Travel. Basically, What I Have Is Several Pieces Of Luggage That I Need To Either Sell For A Low Price Or If A Dreamer/Student/Volunteer Needs It They Can Have It. 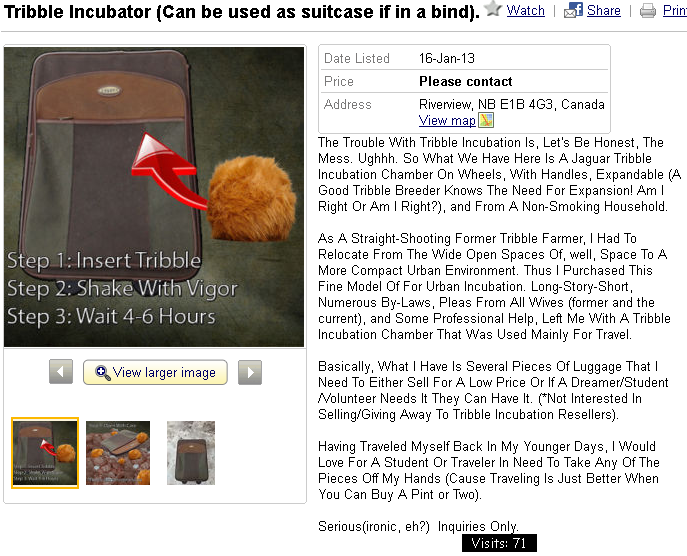 (*Not Interested In Selling/Giving Away To Tribble Incubation Resellers). Having Traveled Myself Back In My Younger Days, I Would Love For A Student Or Traveler In Need To Take Any Of The Pieces Off My Hands (Cause Traveling Is Just Better When You Can Buy A Pint or Two).